Invention may be accident, but science is based on a philosophy, theory based on academic knowledge, skill based on relevant experience and at last the invention should be based on long time research. Creativity is a major component of a scientist. 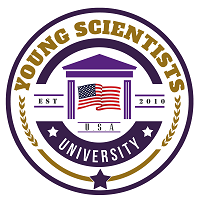 Any visionary committed candidate can become a scientist following methodical steps in the process of Young Scientist University. Young students who are willing to be scientist in the future are carefully brought up by the education system of the university. The authority of the YSU believes entrepreneurship is a vital skill of an scientist to market all.